I've been speaking with Ralph Herbold at the Southern California Research Lodge, and he tells me they've sold over a thousand copies of the book. That is incredible. Thank you, thank you for writing this book. I can't thank Ralph, Norm Leeper and the Grand Master of California enough for their continued support. If you don;'t know about the SCRL, vist their website and join. It's the greatest bargain in Masonic education. Apparently the book is giving AllisonM nightmares. I reject the notion that Freemasonry is dying, and here is why. If you look at each major turning point in Freemasonry's development, you see very clearly that it has changed and adapted to suit the requirements of each moment in history. Bear with me as I hit some of the major turning points that the fraternity has endured, because it is vital that we understand our history before we can make judgments on our present and plans for our future. The 1717 origins were on the heels of the English Civil War, the Enlightenment, the growth of urbanization and the beginnings of a middle class. Nobility was waning as an entitlement, and a merchant class was bringing the rubes in from the hinterlands, eager to make their fortunes. Religious tolerance was a requirement after three centuries of burning each other at the stake. Social class tolerance was a requirement because this new group of businessmen was changing the face of cities and towns. And drinking and dinner clubs were the hot place to go after a long day at the shop. The mid 1700s saw a desire to attract more nobility to the Masons, in an effort to make the fraternity more prestigious than the other run of the mill drinking clubs. In the colonies, the Masons weren't as egalitarian as we'd like to tell ourselves, and the Moderns in the Americas became identified with the Tories and the Royalists when the Revolution broke out. Meanwhile in France, Masonry became a place for the middle class to drape themselves in the trappings of the nobility. Freemasonry became "fashionable", women were initiated into the Order, and Freemasons plumped themselves with a bewildering number of new degrees that made them sound like the rich bastards in the castle down the street: Most Sovereign this, Chevalier de that, Grande haute something or other. The Scottish Rite degrees grew out of this desire to heap high sounding honors on a middle class that would otherwise never receive them. Recall that Napoleon learned early on that the best way to garner loyalty and love among his troops was to invest them with bling bling and pass out cheap medals like free cigarettes at a rock concert. He learned that making the new middle class more impressive was the best way to make his new government a success. They had all of the real money. After the Revolution in the US, lodges began to move out of the taverns into their own quarters, and in many cases, the Masonic lodge began to compete with the local church for attendance. The appendant bodies spread to the US, and the same dynamic began to happen here as in France - don't let anyone kid you into thinking that our early American ancestors didn't want to be knights, pontiffs and princes. Again, we changed after the War of 1812. Freemasonry became THE group to join if you wanted to be identified with the fraternity of the Founding Fathers. That's where the exaggerated claims of Freemasonry's role in the founding of the United States began to take off. Politicians absolutely wanted to be Freemasons, and it did help them get elected. Hence, the huge backlash after the Morgan Affair and the soaring growth in the Anti-Masonic Party, the first third-party in America. So we changed again after Morgan vanished in upstate New York, whether the Masons killed him or not. Everyone figured we did. Lodges closed. Grand Lodges went dormant. The Masons went into hiding. We reemerged in the 1840s and made huge changes to the fraternity to keep the profanes from calling us bad names, and to keep out infiltrators. That's why we open on the MM degree and have no booze in lodges. Both were innovations of the 1840-1870 period. And which is why the Shrine and the Grotto and the Tall Cedars began in the 1870s and 80s. The Blue Lodge became a stoic place of introspection, and largely devoid of anything but the ritual, so the fun groups filled the void. The OES and the Amaranth began before the Civil War because of a growing criticism that Masonry was keeping men out of church and away from their wives. The York Rite didn't begin its peculiar obsession with marching until the post-Civil War days, to capitalize on the desire of veterans to march and drill and relive camaraderie they had experienced in the military (and the Masons weren't the only ones who did this). Again, Masonry changing to meet the desires of its members. Our preoccupation with charity took off before and after World War I because of a national polio epidemic, and then the vast numbers of widows and orphans after the War. There was no AARP, no Social Security, and virtually no pension plans. The rest of the fraternal world was out creating fraternities solely for the purpose of selling cheap insurance to their members. Shriners built hospitals, and the Masons built retirement homes and orphanages. Meanwhile, the period between 1890 and the Depression saw a bewildering - and unsustainable - building boom in Freemasonry and society as a whole. The theatrical presentations of the Scottish Rite became enormously popular, using state-of-the-art special effects, sets and lighting, and performed in magnificent theaters. It was as close to Broadway as you could get in Omaha or Oklahoma. The Masons built lavish Temples. So did the Pythians, Odd Fellows, churches, and governments. Every city today is littered with the bricks and limestone erected during this incredible period of economic growth. Which is partially what led to the bust. The 1929 Depression that lasted well into the 1930s - and arguably until the beginning of World War II - saw our numbers decline. It would take the War to kick start membership to its greatest levels in history. By 1946, new membership was at its greatest peak, and by the 1950s there would be more than twice as many Freemasons in the US than we have today. The World War II generation wanted to party - after all, they had earned it. Freemasonry became a social hall. Dances, card parties, fish frys, pancake breakfasts, rummage sales - all were the events that brought the Masons of the 50s and 60s into lodge. The conferring of degrees in the lodge had sped up during the war so soldiers could be initiated, passed and raised as quickly as possible. And the lodge became little more than a stepping stone to the Shrine and the Grotto. Our wheels fell off with the Vietnam generation. The changes I have talked about came along at roughly 20 and 30 year intervals, and in most cases they were massive changes, when you look at where we started. Every succeeding generation has left its stamp on Freemasonry. Until the 1970s. When the Baby Boomers failed to knock on the lodge door, the WWII generation had little choice but to put their shoulders into it and keep going. Up until that moment in time, a new generation of men came into the lodge and took the reins and adapted it to suit their needs. But not this time. What has happened is that those men who joined fifty years ago have tried to keep their lodges running according to the model of management and programming they created in the 1950s - that's what they knew, that's what worked, that's what satisfied them during the period of Masonry's biggest membership days. So why shouldn't they think theirs was the correct model to hang onto? It had worked before, surely it would keep working. That is why so many lodges today are dying and are suffering from hardening of the arteries. Changing the habits of twenty years is hard enough, as anyone who tried to lose thirty pounds or stop smoking will tell you. Changing the habits of fifty or sixty years is well nigh impossible. Fear of change can turn into downright terror. Throw in a nervous distrust of the young, along with a major case of the heebie jeebies over the advance of technology, and it's a wonder that our more seasoned members don't barricade the doors and call the cops on us. So what to do? I've seen firsthand a lodge vote to kill itself rather than change anything it was doing. The sad truth is that lodges are going to continue to close. What our younger members must understand is that habit and fear are difficult obstacles to overcome, and some lodges won't survive. What our older members must understand is that it's okay to let go. Young men need to be given the same right to adapt Freemasonry to their needs as the previous generations did. That might mean Trestle Boards delivered by email and funeral service requests via text messaging. It might mean a lodge humidor and a cigar smoking room - just like many of our lodges had a hundred years ago. It might mean the repeal of our liquor prohibition. It might mean opening on the EA degree again, as we did for 150 years. It might mean a smaller emphasis on the progressive officer's line as a rigid rule of advancement. It could even mean that the OES will die and that we recognize women's Masonry as more women discover the precepts of the Craft. It will certainly mean that the fraternity will be smaller and leaner, with a stronger interest in the philosophical principles of Freemasonry than we have today. The men who are coming into our lodges today are learning about us in books and the internet long before they petition us, and in many cases they know more about the origins and philosophy of Freemasonry than most of our members. It might surprise you that they are seeking something spiritual that is a connection with the traditions of our ancient past. Brethren, these new men are starving for it. In many cases, they have had little religious background, and their families are more often than not fractured in some way. Few of them have known what is to live with a strong, extended family and to rely on them for support. There's no such thing as long-term job security. They are more mobile than any generation in history. And they live in a world that is very informal and impersonal. There is a void in their lives that Freemasonry can fill. They are seeking our teachings and our history and the brotherhood that we offer. Euchre nights and fish frys don’t appeal to them nearly as much as the more philosophical lessons of the Craft and the strong bonds of friendship we provide. That will have a profound effect on us. 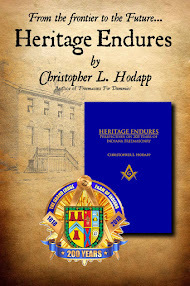 The lodges that will survive will find a balance between serving the needs of its older members, while satisfying the thirst for knowledge and fraternalism of its newer Master Masons. The strongest lodges will provide bus trips to Branson and Medicare Part D presentations, along with esoteric study circles. WiFi hotspots, and Lord of the Rings movie nights. History shows us that Freemasonry will survive. It is patient, even when we are not. But harmony is something that has to be worked at by all of us. It is the strength and support of all societies, but only when we all practice it together. And sometimes the best way to practice it is to let Freemasonry evolve as it always has. 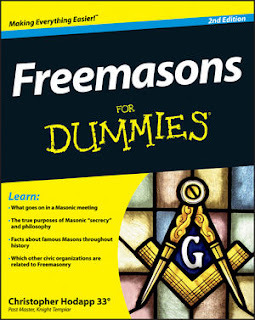 I was asked a few weeks ago about coming to speak about Freemasons For Dummies in a little Pennsylvania mining town called Pottsville. If you've ever read any of John O'hara's short stories about the mythical town of Gibbsville, it's not a myth. It was Pottsville, and he lived in a house just two blocks from where I once lived. Way back in the dark ages of 1968-1970, I spent three wonderful summers with my father and step-mother who lived for a while in Pottsville, at 803 Mahantongo Street, in a decayed mansion that was a deserted hulk when they bought it. It had been built in 1830 by Burd Patterson, a little-known man today, but the first American to pioneer inexpensive iron smelting techniques, as well as a new way to mine anthracite coal. Patterson was instrumental in the early industrial days of the US, helping to wrest control of the iron business from Europe. The Yuengling Brewery was just down the street, and is the oldest operating brewery in America. Elizabeth Yuengling lived in the house for a while in the late 1800s. Then two wacky, reclusive widows who always dressed alike moved in, and the house began to crumble. When they died, the house sat empty for almost 30 years. These were the days long before people rehabbed old homes with anything like loving care, but they did it and turned an eyesore into the greatest house I would ever live in. Heady days for a ten year old kid who imagined ghosts in the attic, skeletons in the basement, a labyrinth in the tunnels that no doubt lurked beyond the eerie passage in the foundation that an underground spring passed through. We had an attic filled with steamer trunks. A 48 star flag. A real wine cellar behind two massive wooden grates. Gas chandeliers with Steuben glass chimneys that had never been wired for electricity. What electric lights were in the house had heavy, oblong Edison bulbs, with huge orange filaments that gave off more heat than light. Neil Armstrong walked on the moon in our front parlor room, I fell for my neighbor Vici Zimmerman, and we cooked for four days and nights during the Great Pottsville Blackout on a hibachi in the side yard. I hung out in the theatre downtown and saw "2001", "Yellow Submarine", and prophetically, "Where Were You When The Lights Went Out?" I learned about plumbing and wallpaper and wiring, about coal mines and railroads and preserving the past before it slips away. And faltering economies. My father worked for Aetna Metal Products and when it closed, the house had to be sold and they moved to Virginia. It took me almost thirty years, but I was in Philadelphia with my wife at a mystery writer's convention in 1998 and we rented a car and drove to Pottsville just to see the house again. By luck, a family had just bought it from the doctor who had purchased it from my father all those years ago, and were ecstatic to let me drag them from one end of the place to the other telling them all I could remember. The previous owner had told them almost nothing about the house and its history, and I had seen it at its worst. Curiously, the new owner, Paul Kulp, was a Freemason, and the topic of Masonry came up. I told him I was strongly considering joining after an experience we had in Texas when my father in law died and the participation in his funeral service of several Masons. Paul and his wife Jan enthusiastically encouraged me to pursue Masonic membership, and on my return to Indianapolis, I did just that. I was initiated two months later. I wouldn't be the same person I am today without those three special years in Pottsville. And I might not be a Mason if I hadn't returned for those few short hours.